"As was the custom of the time, artifacts were transformed into useful items of equipment, therefore the family fashioned The Ashes Bail into a decorative letter opener which measures 292mm long. The Ashes Bail, sealed and coated through a burnished pewter finish, forms the handle of the antique ivory blade, with silver used to meld the bail and ivory. Adjoined to the spigot of the bail is a silver knurl." Every few years the cricket world anticipates each “Ashes” conquest - between old foes, England and Australia - and the capturing of the urn that symbolizes the oldest continuous team game in the world. Each year tourists from all over the world come to Lords to view the "holy grail" of cricket, the Ashes Urn. Yet its legitimate companion, the ashes bail letter opener, remains locked away in a bank vault in Melbourne. How many people are even aware that it exists? This icon of the ashes series remains with the direct descendants of Sir William and Lady Janet Clarke, of “Rupertswood” - birthplace of the ashes - to this very day. It is the family's belief that it is time that this relatively unknown piece of Australian sporting and cultural history took its rightful place in the public domain, and be shared and enjoyed with all the cricket world. England has the urn in its physical form, and it is likely that it will never leave Lords cricket ground again due to the fragility of this historic icon. Australia has its companion, something physical for Australia and Australians to share with the greater public - their “piece” of Ashes history if you like. However, surprisingly the family is finding it somewhat difficult to have this historic piece elevated to what it believes is its rightful place and as a result, the greater public is all the poorer for this resistance from the hierarchy of Cricket. Even the small tourist town of Beechworth, the birthplace of Florence Morphy, seems reluctant to proudly promote Florence and her pivotal role in making the ashes being what they are today. For without the love story between Ivo Bligh and Florence Morphy, the poor music teacher from “Rupertswood”, the Urn and the romance around the Urn would not be the part of history that it is today. And cricket would be all the poorer if that were not the case. 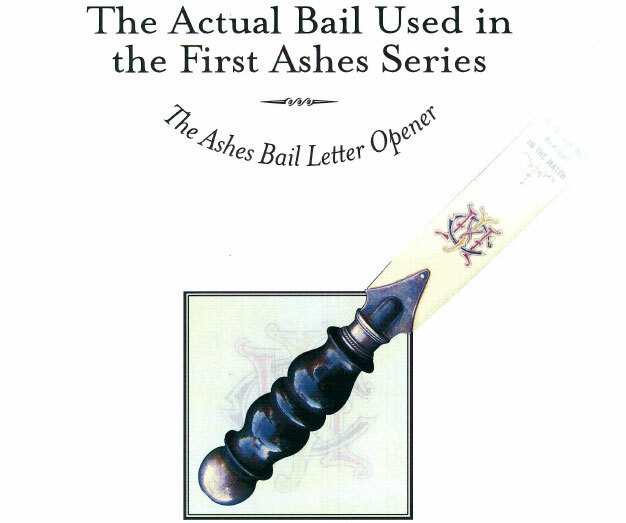 We hope that this website will play its role in bringing greater awareness of the Ashes Bail Letter opener, so that it can indeed be enjoyed by all, as it should be. Read on to learn about this long-hidden icon of international cricket!